The horse is the most innocent and lovable creation of God. He shows loyalty and shower love on us even on receiving the slightest of care. But, some people forget this very fact in wake of their anger and frustration. This is a similar incident justifying the grim fact in which, fortunately, a beautiful soul eventually, came to the rescue. Kelsey Allonge, a teenager from central Illinois, had always been very fond of animals. Though, she was able to establish a close connection with every animal she met, but, it was the horses that had a special place in her heart. Fortunately, she was able to pursue her interest as she had a few horses of her own, whom she loved very much. It is said, that The Almighty chooses only the kind and pure-hearted for doing something noble. It seemed this time it was Kelsey, who The Almighty had chosen. As her sincere love for animals was about to lead her to something wonderful and interesting. It was sheer fate that had led Kelsey and her mother to take a wrong turn which ended up, with them taking a new route to the flea market. On the contrary, originally their plan was to drive to nearby town for a swap meet. But, there was still a twist waiting for them, as, they never quite made it. Since on their way, they noticed a thin horse in a ditch scrounging for food. It was very early in the morning, at about 5:30 am when they witnessed the scene. This made them realize that something was not right. Since they had a strong affection towards animals and a kind heart, they decided to pull over and inspect the horse. On taking a close look, it became evident that the horse was starving and barely able to stand. It was obvious that someone inhumane had left it there to die. The horse was lying in a pathetic state, to worsen the situation, even more, the place was very far from any civilization. Kelsey knew that they had to do something in order to save the poor horse’s life. With each passing minute, the probability of the horse staying alive was diminishing very quickly. The primary need of the hour was to provide the horse much-needed attention. Acting accordingly, her mother agreed to return home to get their own horse trailer. 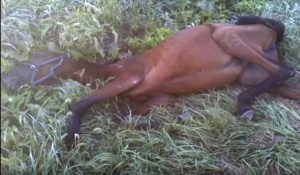 But, the efforts went all in vain, when the foal refused to get inside the trailer and collapsed in the ditch. The situation was frantic for them. The only possible option left was walking the ailing animal home. The chances of the horse making it to the town to receive medical attention were very rare. But, still staying firm and positive, Kelsey managed to coax the horse along with her. Kelsey’s strong will, determination, and love towards animals finally paid off. Somehow, she managed to get the young horse home. There, the vet determined it was about 6 months old, which meant it shouldn’t have been away from its mother at any cost. It was a happy sight for Kelsey and her mother, as, after a week, the foal seemed to be on the path of recovery. The fact that the horse had been released by someone who was incapable of taking care of her also surfaced. It was a very grim sight which they witnessed on closely inspecting the horse, as, it had swollen joints, eyes and whip marks which made it clear that it had been abused. Committing such atrocities on an innocent animal just shows, the extent to which a man can go in order to just release his frustration. The incident left a deep scar on Kelsey’s heart. For a person, who had always showered love towards animals, it was unbelievable to witness something as bad as this.“What kind of person can do that to an animal? She named the foal Sunny and decided to personally take care of it until it fully recovered. Accordingly, she spent the next five nights sleeping next to the horse and making sure it ate and drank properly. Kelsey was very cautious and didn’t even take a single chance when it came to the well-being of the foal. “I didn’t really sleep real good. Pretty much woke up every hour and just watched her,” Kelsey said. Truly, she had developed a deep bond with the horse. Taking care of the horse and catering to all its need, was a routine that Kelsey started to love. After all the hardships, seeing the horse recover and most importantly alive was a sight that made Kelsey emotional every time. She was a pure soul and someone who believed that every creature on earth was a gift of The Almighty who deserved love equally. “A life’s a life and no matter how small it is she needed to be saved. After the horse fully recovered, the tough time of bidding farewell to the horse. But, seeing the bond between Kelsey and Sunny, Kelsey’s mom Cara knew that she had to let the horse stay. This was the best decision seeing that it was better for both of them. Anybody now can justify Kelsey’s decision after realizing the fact that it’s been 6 years on and Kelsey and Sunny are still together. But, surprisingly, Kelsey doesn’t see herself as Sunny’s guardian angel. According to her, “It’s the other way around really. I think she’s a little angel. We were on that road for a reason and I think it’s to get this horse.” This proves how humble and caring Kelsey was in her life. This is a lesson for everybody in this world. It is rightly said that a person’s behavior towards animals is a perfect reflection of his character and true nature. Everybody deserves love and respect, and using one’s authority and power to commit atrocities on others is a heinous crime.